Ambush marketing is a strategy by which a company or organisation uses their marketing communications to associate themselves with an event without being an official sponsor or authorised partner or licensee. It has become a particular concern in the marketing of major sports events, with international sponsorship and branding properties worth many millions of dollars. 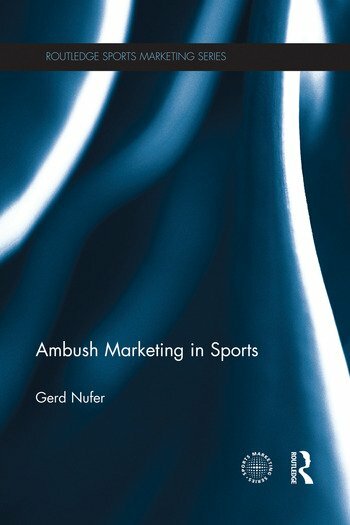 Ambush Marketing in Sports is the first book to offer comprehensive analysis of the theoretical and practical implications of ambush marketing. Drawing on cutting-edge empirical research data, the book outlines an innovative model for understanding ambush marketing and offers practical advice for all stakeholders, from sponsors and event organisers to media organisations. The book examines the opportunities and the risks of ambush marketing, assesses the legal, ethical and business dimensions, and offers advice for preventing ambush marketing in a range of contexts. Fully supported throughout with examples and cases from major international sports events, such as the FIFA World Cup and the Olympic Games, this book is important reading for any student, researcher or practitioner with an interest in sport marketing, sport business or event management. Gerd Nufer is Professor of Business Administration specializing in Marketing and Sport Management at Reutlingen University, Germany. He is also Director of the German Institute for Sport Marketing based at the same university. Gerd worked in the marketing industry before moving into academia and has published widely on the subject in both journals and books.